The AWP conference is the biggest writers’ conference in North America. It happens in a different city every year and this year it was in Portland, so I went. I asked my favorite fashion-maven Liz Smith for shopping help so that I wouldn’t show up at the conference in my jammies. I am fashion-impaired and also work at home in Portland, OR, and that look won’t do. 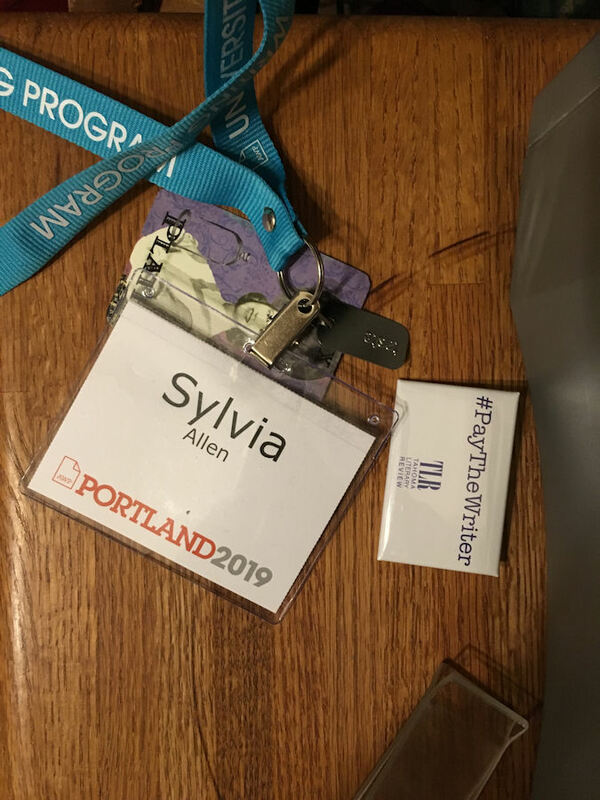 Having also had excellent advice from Kate Carroll DeGutes, a terrific writer and veteran of many AWPs, I chose two or three offerings for every time slot, because often your first choice turns out to be full, or not as advertised or (in my case) imagined. There were more than 12,000 attendees. That is a lot. 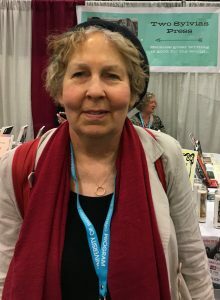 The conference included a book fair that had over 800 booths and took up almost the entire ground floor of the Oregon Convention Center. Twice, on the first day, I got lost in the book fair and couldn’t find my way out. Most days (thank you, Liz!) I wore some combination of a slinky little black dress, black leggings, some kind of floaty thing over these, and lipstick-red flat boots. I felt so cute! I was one of those people walking around and other people were looking at me. In a good way. I so enjoyed that. I even stood up in the panels and asked questions, confident that I looked OK. On the other hand, the convention center was basically refrigerated and I froze. The last day I couldn’t take it anymore and piled on layers. R178, Literary Agents 101. Mainly about talking to agents. “After the reader has read your book, what do they take away?” Know what you want your agent to say; if they don’t say it, they’re not the right one for you. R233, Bridging the Gap, about writing historical fiction. Phong Nguyen: “You can create a world that’s convincing and somewhat factual.” Amy Brill: “Get it right.” I’m with Amy. R252, Writing the Mother Wound, about writing traumatic mother-daughter relationships. 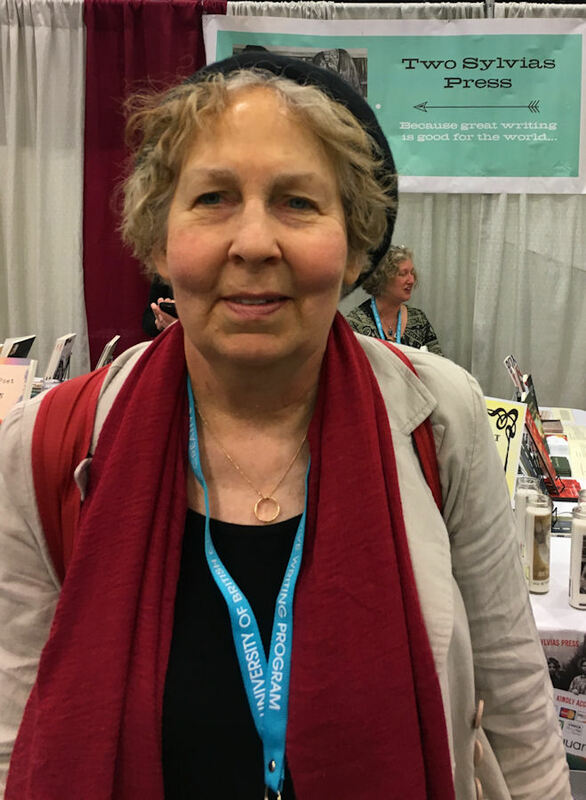 This panel included another terrific local writer, Rene Denfeld, who said, “There is no hierarchy of pain.” Rene is interested in mothers who betray, who are complicit in abuse. I was embarrassed because I never noticed that almost every main character in both of my books is unmothered. F143, The Coast Is Queer: LGBTQ+ Voices from the Pacific Northwest. This was one of those panels that seemed more like having a coffee with five really interesting people, most notably local writer and writing coach Kate Gray. It was so interesting that I forgot to take notes entirely. I do remember asking, “I’m a writer who is queer, and definitely not closeted, but most of my writing is not about that. Am I a queer writer?” Consensus: Yeah, as long as you’re explicitly out everywhere you go. F196, Beautiful Minds: Writing Mental Illness. I wanted this to be about writing characters who are schizophrenic, kind of thing, but what I got was Five Depressed Poets. Didn’t stay. S131, You’re Already Doing It, about working with a smaller publisher. I took three pages of truly useful advice, and was annoyed by one person repeatedly saying “exetera.” Learn how to use social media. S171B, Legal and Ethical Issues, when writing about real people. Dead people can’t be libeled. Their privacy can be invaded, though. The conference bookfair. It was refrigerated and I froze. Had to layer up. S198, Publishing Queer: What Was, What Is, and What Just May Be. Another panel that felt like an evening in a dive bar with five of the coolest people you ever met, even though, or possibly because, it was near the end of the conference and everybody was exhausted. Beth Marshea, Kate DeGutes, tammy lynn stoner, Tobi Harper, and Nick White. Too much fun to take notes. Love this! Thank you for sharing your impressions of the conference. Thank you, Mary Ann! And I’ll post some post-conference thoughts in a few days. So glad you had a good conference – loved your insights into the panels. This was an excellent write-up of an event that seemed a *little* over the top. I subscribed to yer blog! Thank you, Gabriella! What–you weren’t there, were you? I appreciate your subscribing!